Engine Parts Group, Inc. (the parent of Engine Pro) was founded in 1989 by independent engine parts distributors looking for a way to work cooperatively in buying and marketing.Today it functions as both a distribution network for brand name internal engine parts and as a specialty engine parts producer, marketing under the Engine Pro name. Engine Pro sells exclusively to engine builders, machine shops and jobbers. As part of our tradition of specializing in distributing engine parts to engine professionals, Engine Parts Group now serves more than 12-thousand customers from 36 distribution centers. We have an outside sales force of 40 people and an inside sales force of 85 working on two continents. Our strong partnerships with top engine parts manufacturers lets us give preferred pricing to our customers and stock large parts inventories, including those that are slower moving or hard to find. 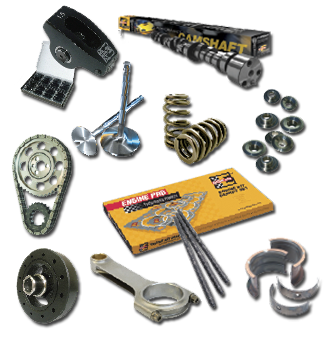 Engine Pro produces high performance engine parts under the Engine Pro name. This line continues to grow with the frequent addition of new parts and applications. Engine Pro brand products are designed to offer the highest quality in high performance parts along with a moderate price to give racers and performance engine builders a more affordable way to do what they do best—win races.